The Winter Comes | W. Wayne B. Posted on October 13, 2013	by W. Wayne B.
I am watching winter fold through the sky. Closed windows battle cold winds. My bones feel the silent snowfall. As I rest, I hear a clock ticking. I am worried because it is so cold. I want to sleep past the morning. Perhaps I will feel better tomorrow. I hope you will be happy soon. I have a candle burning for you. I hope the storm will be gone soon. 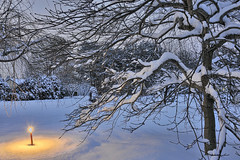 This entry was posted in Poetry and tagged candle, cold, love, sleep, snow, winter, z1516. Bookmark the permalink.